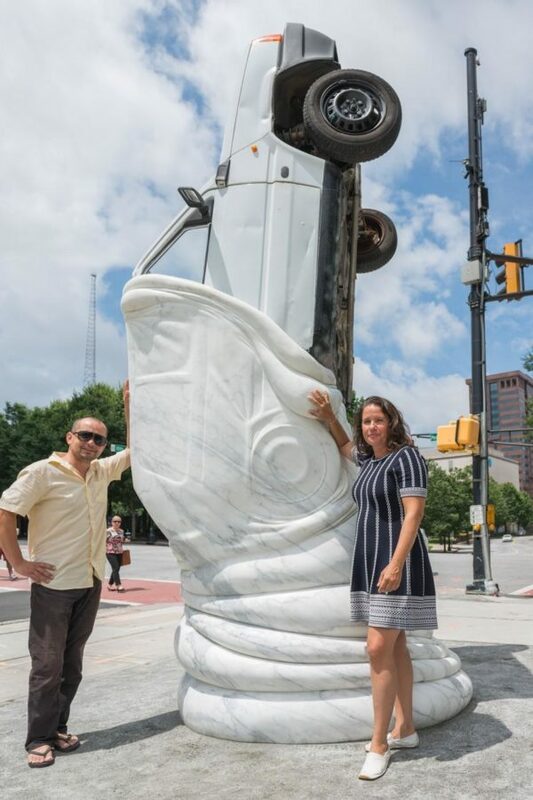 Julia Venske and Gregor Spänle are the artist duo behind Atlanta’s newest public art piece. Photo by Gene Phillips. The corner of 10th Street and Peachtree Street has a new sculpture. 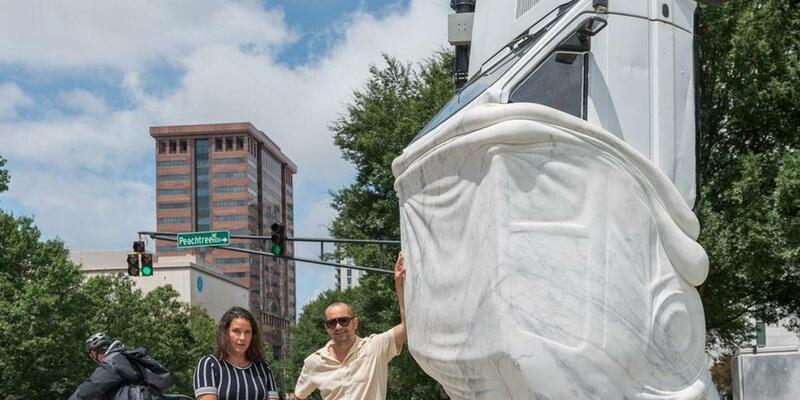 It’s called “Autoeater” and looks just like it sounds: a car being eaten by a slab of marble. Weighing 16 tons and mined and built it Italy, it was created by artist duo Julia Venske and Gregor Spänle. “We really want to have that effect that it looks like its swallowing the car,” Venske said in an interview with “City Lights” host Lois Reitzes. Venske and Spänle’s work generally employs marble with some sort of domestic item implied within it. They decided to use a Fiat Panda as the car, which they bought themselves, drove to their studio and cut in half. And for the pair, a car being swallowed is a perfect conversation starter for Atlantans. “For us, [Atlanta’s] a lot of the traffic and it’s a lot about the forest. But the traffic is just really obvious,” Venske said. “Autoeater” is part of the Midtown Alliance’s temporary public art program. The sculpture replaces “The Rockspinner,” which was removed in April. This article originally appeared with an audio interview on WABE.org. “Autoeater” weighs 16 tons and was mined and built in Italy. Photo by Gene Phillips.